Conventional liquid electrolytes based sodium metal batteries suffer from severe safety hazards owing to electrolyte leakage, inflammability and dendritic sodium deposition. Herein, we report a flame-retardant quasi-solid polymer electrolyte with poly(methyl vinyl ether-alt-maleic anhydride) (P(MVE-alt-MA)) as host, bacterial cellulose (BC) as reinforcement, and triethyl phosphate/vinylene carbonate/sodium perchlorate (TEP/VC/NaClO4) as plasticizer for highly safe sodium metal batteries. The as-obtained quasi-solid polymer electrolyte exhibits superior flame retardancy (self-extinguish within 1 s), complete non-leakage property and wide electrochemical windows (4.4 V). 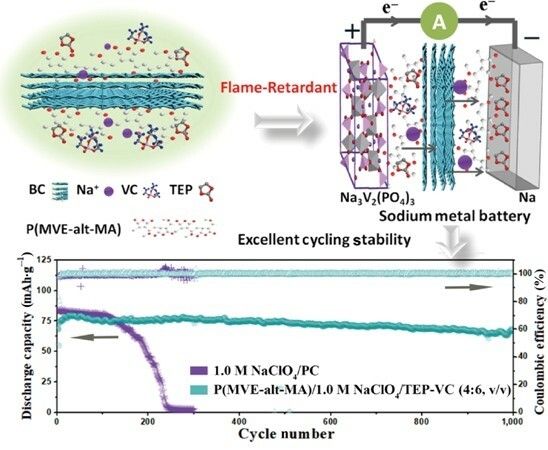 More importantly, Na3V2(PO4)3/Na metal batteries using such polymer electrolyte delivers superior long-term cycling stability (84.4% capacity retention after 1000 cycles) which is significantly better than that (only 2% after 240 cycles) of liquid electrolyte. In addition, this flame-retardant quasi-solid polymer electrolyte provides favorable cycle performance (80.2% capacity retention after 70 cycles at 50 °C and 84.8% capacity retention after 50 cycles at −10 °C) for Na3V2(PO4)3/Na metal batteries. And this battery also displayed a normal charge/discharge property even at −15 °C. 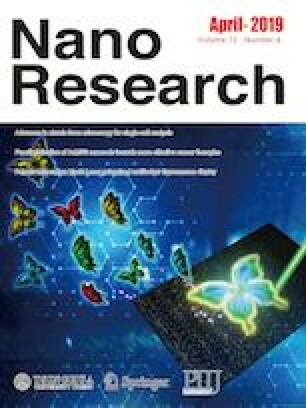 These fascinating cycle properties are mainly ascribed to the effective protective layers formed on Na3V2(PO4)3 cathode and sodium metal anode. More thorough investigation elucidates that such flame-retardant quasi-solid polymer electrolyte plays a multifunctional role in the advanced sodium metal batteries: (1) Being involved in the formation of a favorable cathode electrolyte interface (CEI) to inhibit the dissolution of vanadium and maintain the structure integrity of the Na3V2(PO4)3; (2) Participating in building a stable solid electrolyte interface (SEI) to suppress the growth of Na dendrites; (3) Integrating flame-retardance into polymer sodium batteries to enhance flame-resistance, eliminate electrolyte leakage, and thus improve safety of sodium batteries. Based on these results, we further assembled Na3V2(PO4)3/MoS2 pouch cell which can withstand harsh conditions (bended or cut off a corner), confirming the obtained polymer electrolyte with superior non-leakage property. In all, these outstanding characteristics would endow this flame-retardant quasi-solid polymer electrolyte a very promising candidate for highly-safe sodium metal batteries. Jinfeng Yang and Min Zhang contributed equally to this work. Supplementary material (typical SEM images, EDX images (C and O), FTIR spectra of PMM-CPM; XRD patterns of bacterial cellulose at different temperatures; digital photographs, viscosity tests of different electrolytes; XRD patterns of FRPMM-CPE at different temperatures; flame test of NaClO4/TEP-VC (4:6, v/v) electrolyte; Nyquist plots of stainless steel/stainless steel symmetric coin cell using FRPMM-CPE at different temperatures; LSV of stainless steel/Na asymmetrical coin cell using FRPMM-CPE; cycle performance (2 C) of Na3V2(PO4)3/Na metal battery using FRPMM-CPE; comparison of the cycling stability of Na3V2(PO4)3/Na metal battery using different electrolytes including 1.0 M NaClO4/PC electrolyte, 1.0 M NaClO4/PC-VC (95:5, v/v) electrolyte and 1.0 M FRPMM-CPE. ; cycling stability (0.1 C) of Na3V2(PO4)3/Na metal battery using FRPMM-CPE after 50 cycles at −10 °C; cycling property and charge/discharge curves of Na3V2(PO4)3/Na metal battery using FRPMM-CPE at −15 °C (0.05 C); DSC curves of P(MVE-alt-MA) and P(MVE-alt-MA)/NaClO4/TEP-VC(4:6, v/v); cycle stability (1 C) of Na3V2(PO4)3/Na metal battery using FRPMM-CPE at 50 and 80 °C, respectively; typical high-magnification SEM images of different Na3V2(PO4)3 cathods; HOMO-LUMO of PC, VC, TEP and P(MVE-alt-MA) and the correlated energy-level diagram; typical SEM images, high-resolution XPS spectra of Cl 2p and O 1s of pristine Na3V2(PO4)3 cathode and Na3V2(PO4)3 cathode dissembled from Na3V2(PO4)3/Na metal batteries using NaClO4/PC electrolyte and FRPMM-CPE after 300 cycles, cycle performance of Na3V2(PO4)3/Na metal batteries using NaClO4/TEP electrolyte, NaClO4/VC electrolyte and NaClO4/TEP-VC(4:6, v/v) electrolyte; typical SEM images of Na anode disassembled from Na3V2(PO4)3/Na metal batteries using NaClO4/TEP electrolyte and NaClO4/TEP-VC (4:6, v/v) electrolyte after 300 cycles; Coulombic efficiency, voltage profiles of Na/Cu cells using 1.0 M NaClO4/TEP and 1.0 M NaClO4/TEP-VC (4:6, v/v) electrolytes; comparison of the cycling stability of the Na/Na cells using 1.0 M NaClO4/TEP and 1.0 M NaClO4/TEP-VC (4:6, v/v) electrolyte (0.15 mA/cm2, 0.3 mAh/cm2); cross-section SEM image, EDX images of Na3V2(PO4)3/MoS2 full cell using FRPMM-CPE) is available in the online version of this article at https://doi.org/10.1007/s12274-019-2369-9. This original research was financially supported by the National Natural Science Foundation of China (Nos. 51703236 and U1706229), the National Science Fund for Distinguished Young Scholars (No. 51625204), the National Key Research and Development Program of China (No. 2018YFB0104300), Think-Tank Mutual Fund of Qingdao Energy Storage Industry Scientific Research, Key Scientific and Technological Innovation Project of Shandong (No. 2017CXZC0505).